Camping luxury is taken to the next level thanks to the services offered at Camping de le Brise. This resort is found within the Camargue region of southern France, not far from the pristine waters of the Mediterranean Sea. Thanks to its location close to the holiday town of Saintes Maries de la Mer, leisure activities abound and a tranquil climate awaits. Lux-Camp will be happy to answer any additional questions. Why Should I Camp at Camping De La Brise? It is possible to rent luxury tents and mobile homes. Immediate on-site access to private beaches. A large water park is found only moments from the beaches here. 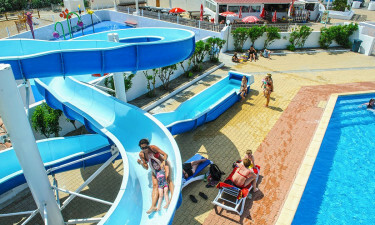 The site contains water slides, open-air pools, a lounge area for parents and fun activities for children. 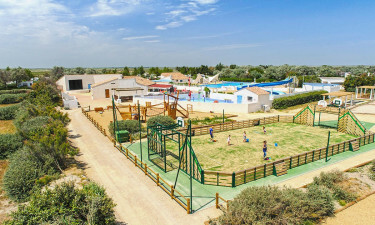 Some of the facilities offered throughout this luxury camping resort include free wireless internet access, a linen station, a fully equipped launderette and a sanitary changing area for infants. All of these facilities are accessible by wheelchair. There are several dining and shopping opportunities found within this holiday camping site. A large snack bar offers an excellent dining experience, thanks to a large terrace and views of the nearby ocean. A grocery store provides all essentials, including bread, croissants, international foods and local delicacies of Camargue. Common necessities such as newspapers, tobacco products, maps and souvenirs are also found within this store.